There is an 80-acre parcel for sale virtually next door to the Dancing Rabbit Ecovillage, which is located in the north east corner of Missouri. Rural Missouri is one of those places that is very open to alternative & sustainable architecture making the creation of communities like Dancing Rabbit much more feasible. The rural location can also be a bit isolating which is why developing clusters of communities like this is essential. Luckily there are three such communities are already growing there, providing each other the beginnings of a much wider sustainable community, Dancing Rabbit Ecovillage, Red Earth Farms, and Sandhill Farm. The parcel for sale is outlined in black, and this is an actual Google Map so feel free to explore. Now imagine taking this 80-acre parcel, with an existing home built from an old church, and develop a new ecovillage based on living simply & sustainably in small homes. The seller is asking $240,000 for the property and since there is an existing home, a traditional mortgage is probably possible, unlike raw land. So theoretically this community could be started by one founder with a good work-from-home job or someone prepared with seed money. Another way to finance an endeavor like this could be to simply collect a few founders with the money, or credit & income, to make the initial investment. The existing home could eventually serve as a common building, and with the bones of a church seem well suited to be turned back into a space co-owned by the community. It would be up to the founders and community members to decide what kind of community to grow here but it seems like an ideal location and the price seems very reasonable. To learn more about this 80-acre parcel for sale and continue to daydream the possibilities visit the Dancing Rabbit website. Above are some photos of the main house. Below is a photo of some cob house dwelling neighbors at the Dancing Rabbit Ecovillage. To learn more about Ziggy’s cob house visit The Year of Mud: Cob and natural building. Photo by Stephen. This entry was posted in Community Design and tagged cob house, dancing rabbit, ecovillage, land for sale, Tiny House Community, ziggy. Good find and great idea Michael. I hope somebody steps forward to pick it up. It would be a great project, in the right place. Michael, thanks for posting this to your users! Happy to help Nathan. I hope you all are getting the benefit of the flood of traffic this past weekend. 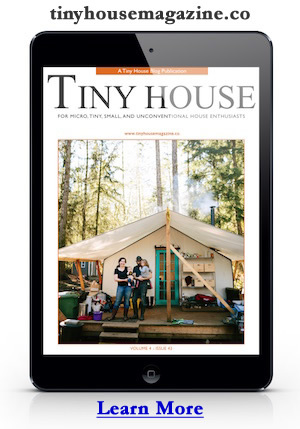 Many new readers discovering tiny houses via a video of Jay Shafer on Yahoo’s homepage. A. made enough from my work at home job to get a mortgage..
B. could find enough people to go in on this together so we could pay cash..